"KEM-Talent Clash" "All dimensions n' diversions are at one point convergent !" Pre-liminary auditions n screening will be started soon and continued over a month ! You may perform anything alone or in a team of maximum 4 people , in a time of max 3min u have to show your talent on stage. Stage performances will also be projected onto screen in the show by a live camera!! SO come up with anything you have got ! Tricks ? Magics ? Skits ? Puppet show ? Come up with anything you believe in as special ! And finally, the best talent as suggested by the judges and by the "audience response" wil be awarded a heavy prize ! 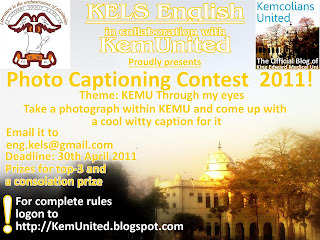 KELS English in collaboration with KemUnited Proudly Presents Photo Captioning Contest 2011 For all the creative young photographers out there, here's your chance to prove your artisic talents with a literary twist! All you need to do is take photographs based on the theme 'KEMU through my eyes' and submit them with a cool and witty caption. Photos would be judged on the basis of both the photography skills of the participants and the creativity and imagination that they'd put in their captions. Public response would be judged by the number of Likes on KemUnited facebook page. Photos will be uploaded after the deadline is over. So what are you waiting for people? Grab your cameras and let your imagination work its magic. Last date of entry submission is 3rd May 2011. ***Exclusive KELS prizes (Trophies) and certificates for the first three position holders plus a consolation prize. 2. Hepatitis-the real picture:- Hepatitis awareness seminar (includes lectures, skit on Hep C prevention n prevalence, interactive session + quiz competition n poster exhibition) on 2nd may, 2011 in KEMU auditorium (12 p.m onwards). 3. Beat Hepatitis C, Treat Hepatitis C-awareness campaign from 3rd may to 7th may at Mayo hospital, Lahore. *Registeration open for volunteers for awarenss campaign. Register today with your respective SPWS cr/gr. 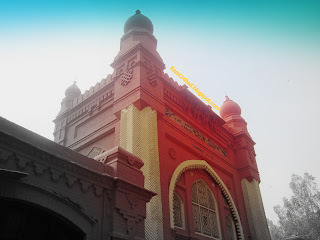 Last date for registration: 29th april, 2011. *All volunteers will get certificates from SPWS and APPNA. Attendance at seminar is compulsory for all volunteers. 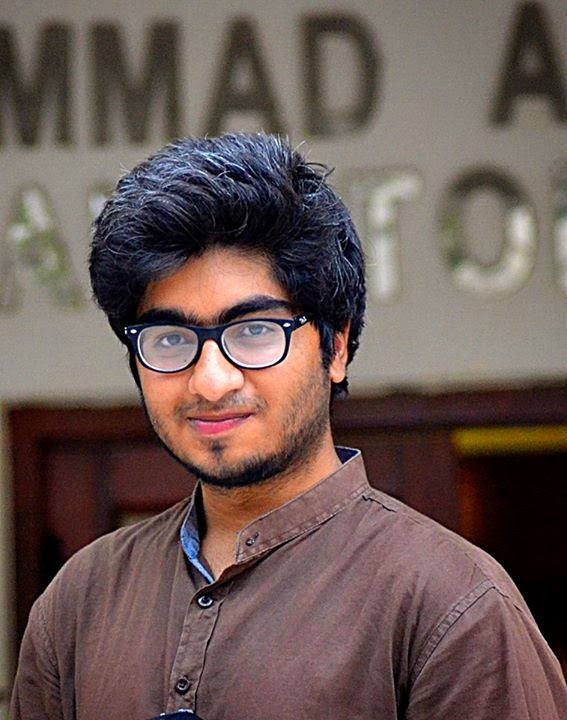 For details, contact Ahmed Naseer(Project Advisor): 03314823383 or Omer Farooq(Project Manager): 03334306489.
build better lecture theaters,make Saturdays off and make K.E the best institute in research.The five things he aspires to achieve before leaving K.E are to be a better person,become a good doctor,improve his communication skills,help as many people as he can and most of all enjoy his stay.He likes to surf kemunited.com.If he could undo one invention,it would be mobiles! Get a glimpse of an average day in Dissection Hall. Meet The Budrooh Group who cat-walks in Overalls,the Qasai-gang who shows a macabre interest in cadavers,The D.H Quacks whose focus is to build up a nerdy repo,the high-scoring Curious Group,the route-learner B.D-rutta-group and finally the North American Black Horses! If you’re a Kemcolian and are into videos n music (and psychiatry cases :P), 23rd April must have been YOUR day!! Yup, tis was the day KAPS presented its much awaited ‘Interclass Video Competition and Music Show’. WHAT AN EVENT!!! With videos that were bigger and better than last year and musical performances that rocked the stage, it was truly a day to be remembered! Creativity soared sky high with every year making excellent video contributions… though Wapda’s contribution to the event seemed the most noticed! Oddly, ‘going nuts’ seemed a popular theme this year. Spooky! The event also highlighted the winners of the live sketching and photography contests. SPWS in association with APPNA brings you the 'Beat hepatitis C, treat hepatitis C' Poster competition.All students of KEMU, belonging to MBBS, BDS, Vision sciences, physiotherapy and allied health sciences are invited to participate in it with their brilliant ideas. 1.Water colors, oil pastels, poster colours and crayons are acceptable. 2. Make posters on chart paper or cardboard. Scholar paper will be prefered(available in 22 by 15 inches). 2)Use of material such as glaze paper, kite paper or other material on top of it is allowed. 3)Size should not be more than that of a standard chart paper(approx 22 by 28 inches). 4)It should be handmade. No digital posters, printed material or poster/picture frm internet will be accepted. 5)Caption is compulsory,Uniqueness n relevance of the caption will be rewarded. 6) 1 poster can only be submitted against a single name only. No teams are allowed. However, 1 participant can submit more than 1 posters. PRELIMINARY ROUNDSwould take place on 3rd May 2011 between all participating teams. A total of 30 questions would be asked from ALL categories. In case of a tie, a tie-breaker round would be held for qualification to the grand finale. GRAND FINALE would fall on 5th May 2011 between the five top teams of the preliminary rounds(one from each year). Do you want to increase your knowledge and have some electrifying fun at the same time ? Its an OPEN event ... ANY KEMCOLIAN CAN TAKE PART ! 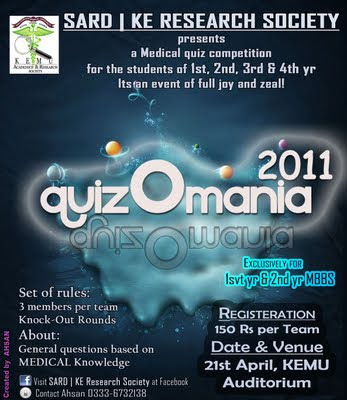 Specially for 1st and 2nd yr MBBS !!! Hello there! We're back again today with some more choice bits of colourful reads from Kellogs. For those of you who just went 'What on earth is she talking about DUDE?! ', you're welcome to join the ride by going through this first! And now without further ado, we move on to our selections for this week. Starting up, we have Farkhanda Qaiser giving us an exclusive tour through the various entertainment places for kemcolians and some much needed advice on shopping in Anarkali. For all you girls out there, this one is a must-read. Kemcolians Chronicles Part 1. Why do Names of Carpel Bones remind Lulu of a boat, a full moon , an empty cube ...? 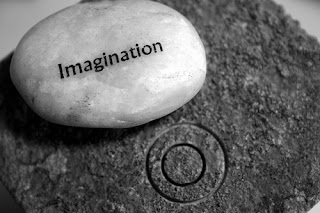 How much imagination do you use while learning your subjects ? If I talk of a beating heart , can you imagine that ? Yes ! Reason ? You've seen animations of beating heart numerous times . Its easy ! If I ask you to name the types of muscles in the body , you'll easily recall them as bipennate , cruciate , trianglar etc etc . Right ? Reason ? You've seen the diagrams in GA . Good ! Now if I ask you to imagine the NAMES of tarsals or say the carpels , can you imagine THAT ? Not that easy ! Reason ? They have no animation. No diagrams either. You have no mental imagery for them. They are just a heap of alien-sounding words. Aren't they ? Anatomy Museum Models Mostly Embryology. Unlabelled. Top Eat-outs Around KEMU !! Well, yeah the title might sound odd...but trust me, the food is one of the best parts about KE or should i say Anarkali. The variety, the delicious mouth watering taste of Anarkali food is ONE-OF-A-KIND and its a luxury that only us kemcolians enjoy. You doubt that? If so, go to AIMC, and try their tasteless pheekay fries and dry shawarmas and then you will realize what i'm talking about...! 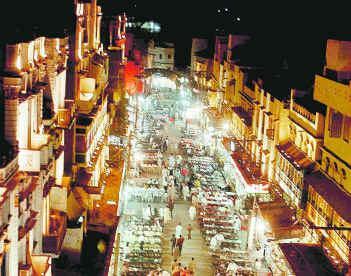 First of all, the ever famous Al-Karim which according to kemcol data, earns half of its income from kemcolians. The best item is the band-makhan burger. If you're an over-obesity concerned girl then let me tell you that it sure has alot of calories so make sure to share it with a friend of yours.